At ResTech Solutions we are committed to ensuring everyone has the knowledge, tools, and resources they need to be successful with using technology. Everyday we are using a piece of technology at least once to do something and many times this occurs more than we realize as it has nearly become second nature to us. When it really becomes obvious is when we have a problem, whether it is a technical issue or a lack of knowledge. Our ultimate goal is to help remove this road block, or at the very least reduce it. All of our training and education service offerings can be customized to meet your needs. Please contact us to learn more or schedule a session. Our onsite training option allows for training to be given at your office or at another location you provide. 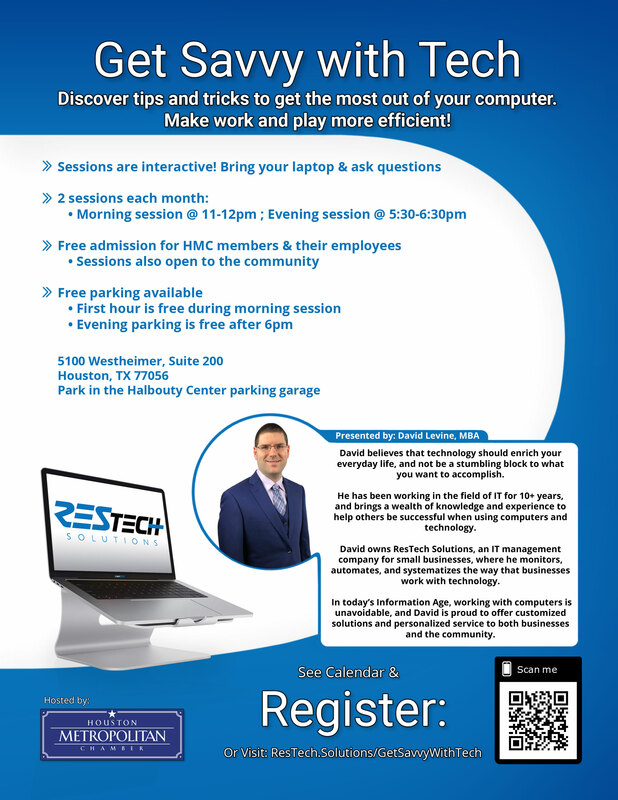 ResTech will conduct training on any number of topics you require for your staff. All trainings cover the technical aspects staff need to know without all the technical verbiage to provide your staff with the required skills and knowledge they need. If you require training on any custom or proprietary applications please contact us to inquire about specialized training. Our group class are available for anyone to attend. These classes will be offered in several formats including: subject based classes, open-ended (Q&A) classes, and hands-on training. Classes will also range from entry level to more advanced skill sets. Group classes can also be sponsered by your business if you are unable to do an onsite training. Our senior education services are tailored for the senior members of our community. These education services are designed to help teach the basics of living in our age of technology and to provide the basic skill set required. We focus on how to be safe online and to recognize and avoid scams. We also focus on the basic use and operation of computers and mobile devices.